Governor Scott Walker is not saying whether Foxconn may be considering a second Wisconsin site. The Milwaukee Journal Sentinel reports the Taiwanese electronics maker may be looking at building a facility in Dane County, in addition to its plans to build a major factory in southeastern Wisconsin. Walker on Wednesday declined to comment on that possibility. “Any sites…are really way premature. We don’t even know what, if anything, may be the particulars of something like that,” Walker said. However, the governor noted the company is clearly excited about Wisconsin, as seen by an agreement it signed with the state’s Ginseng growers. “That’s one of many examples I think will come forward of where they have an interest in doing business beyond just this particular site,” he said. Walker said his focus right now is on getting an incentive package through the Legislature that will clear the way for Foxconn’s planned development in southeastern Wisconsin. While Assembly Republicans seem in line with that push, Senate GOP leaders have indicated they are in no rush to act on the bill. Instead, they want to focus on getting the overdue state budget passed. Walker said both can be done at the same time though. 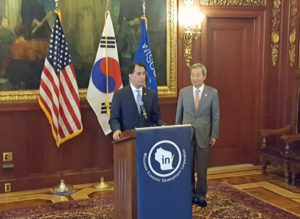 Walker’s comments came after during a press conference with South Korean Ambassador to the United States Ahn Ho-young, where he announced he would lead a trade mission to Japan and the South Korea in November.